Longtime PopCult readers know that I am a big fan and supporter of the Charlton Neo movement. 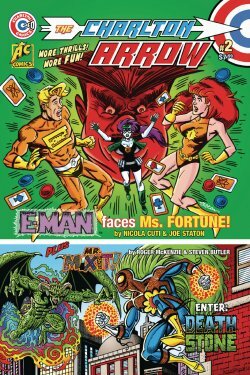 This semi-revival of the beloved Charlton Comics was born out of a Facebook page and became one of the most positive forces in fun comic books over the past few years. The original Charlton Comics was an also-ran comic book company from Derby, Connecticut that was a low-budget launching ground for many of the top names in the comics industry. John Byrne, Mike Zeck, Roger Stern, Paul Kupperberg, Jim Aparo, Roy Thomas, Denny O’Neil, Roger McKenzie, Don Newton and dozens of other comics greats had their first professional work published by Charlton Comics. Back in 2014, nearly thirty years after Charlton closed up their comics division, a group of fans led by Fester Faceplant fostered a revival of the Charlton spirit in that Facebook group. 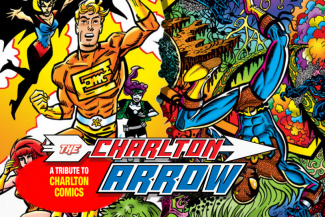 Several Charlton vets teamed up with fans and newcomers and created The Charlton Arrow, an anthology that carried on the tradition of fun and unleashed creativity that made Charlton such a memorable force in comics. It was the most unlikely comic book revival ever, and it was loads of fun. 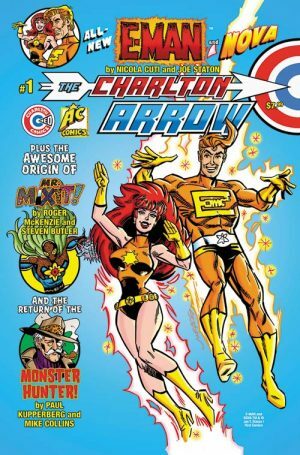 Last year The Charlton Arrow, which had previously been independently distributed outside of the comic book shops served by Diamond Distributors, relaunched with a new first issue and a foot in the door of comics shops, as they finally made it into the Diamond system via a deal with Americomics. Unfortunately, it appears the timing was not great for that move. Even with the return of the highly-acclaimed “E-Man,” by the original creators, Nicola Cuti and Joe Staton, The Charlton Arrow has been able to sell many copies. While Diamond is making the books available for order, they’re not doing such a great job getting the books to the stores that ordered them. 2017 was a disastrous year for the comics industry, as Marvel flooded the market with books that simply did not sell, leaving comic book shops wary of trying out any new titles from other publishers. Last year was so bad that over fifty American comic book shops closed their doors for good. Charlton Neo has seemingly been cursed with the same luck as their inspiration. Charlton Publications was founded in prison, survived a flood in the 1950s that wiped out their offices and printing facilities, and were easily crowded off of newsstands in the 1970s the first time that Marvel flooded the market with books that nobody wanted. After switching to publishing nothing but reprints for a few years, Charlton sold off their best-known characters to DC Comics, and withdrew from publishing comics in the mid-1980s. Charlton Neo hasn’t fared much better, luck-wise. Landing The Charlton Arrow at Diamond was a major coup, but Diamond has not done a stellar job of handling their end of things. As an example, I am a customer of Westfield Comics, a long-running and well-established mail order comic book subscription service. I’ve been with Westfield for twenty years now. In that time, I have never missed an issue of a comic book that I’ve ordered. At least I hadn’t missed one until I ordered issue #2 of The Charlton Arrow. It was delivered to stores almost two months ago, and Westifield Comics hasn’t gotten it yet. They haven’t given up hope, but Diamond has yet to send them their copies of the book. Publishing a comic book through Diamond is a financial risk in the first place. If you sell a comic directly to the public, you keep the entire cover price. If you sell to Diamond, you only get forty percent of the cover price. A publisher has to sell more than two-and-a-half times as many comics just to make the same amount of money that they do selling direct. Theoretically, having your book for sale in thousands of comic book stores where way more people will be exposed to it would make selling that many more books possible. But you have to convince the stores to order enough copies to have some left over to put on the shelves for people to see, and you have to count on Diamond to deliver those books on time. Niether of those things has happened yet with The Charlton Arrow, and now the Charlton Neo movement is in trouble. Couple that with the fact that a few financial calamities that have befallen the publisher, and there have been some major unexpected and expensive delays with their Kickstarter projects, and Charlton Neo is in need of a quick cash infusion. The recent hacking of their Pix-C website compounded the problem, because that was one of the incentives for their Patreon supporters. 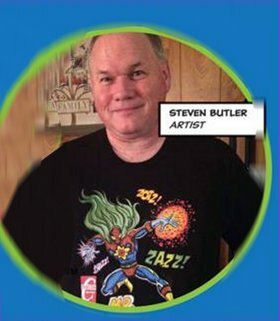 So Charlton Neo has turned to GoFundMe, and the campaign offers some really nice incentives for donors: starting with digital comics, and increasing to prints, hard copies of comics, a really cool Mr. Mixit T Shirt (seen right, modelled by the artist, Steven Butler), limited edition autographed comics and even original art. I’m going in for the T Shirt, and possibly more. I hope that some of you have become fans of Charlton Neo through my blog, and decide to kick in as well so that we can get more of these fun comics in the future. These are comics that are indeed a labor of love, and contain more fun in a single issue than most corporate comics manage in one of their two-year-long story arcs about the death and resurrection of their heroes. You can find the GoFundMe page HERE, and order back issues of their great comics HERE.